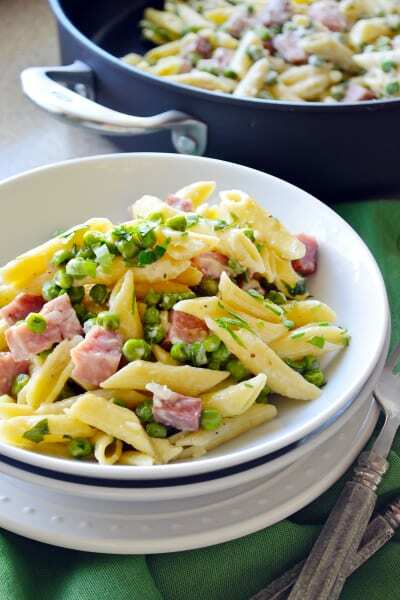 One Pot Creamy Ham & Pea Pasta is a comforting meal that hardly takes any time at all. A great weeknight dinner. In a dinner rut? Don’t worry. We all get in them. I think it’s pretty normal. 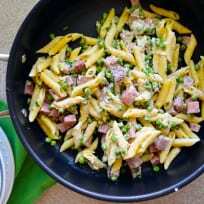 This week (or next) you can try my recipe for one pot creamy ham and pea pasta. You will have dinner on the table in less than 30 minutes (that includes prep time). What makes this recipe quick cooking is the store-bought cooked cubed ham. It’s a time saver and tastes just as good as a slow cooked ham. Of course if you have leftover ham, by all means dice it up and use it in this recipe. 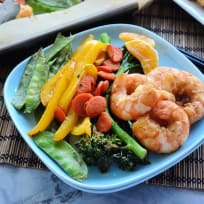 My toddler loves this dinner, and it’s become a family favorite; making the dinner rotation at least once a month. 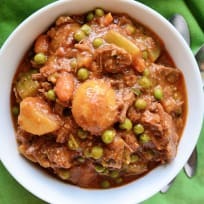 He loves the bite-size pieces of ham, the green peas and of course who can resist a good creamy pasta sauce? 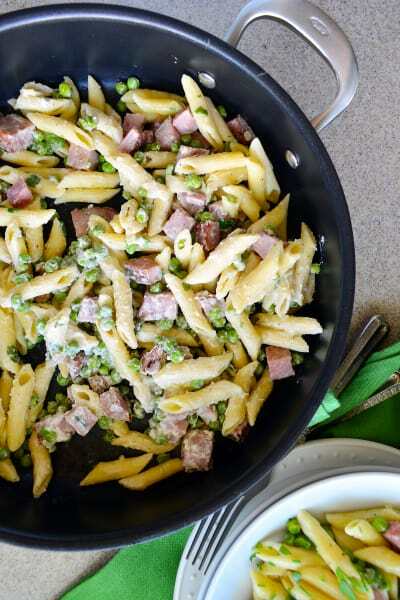 I love using my big OXO skillet in this recipe. 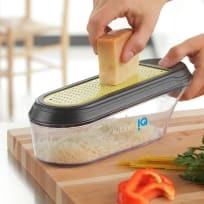 It holds all the ingredients with plenty of room for cooking. 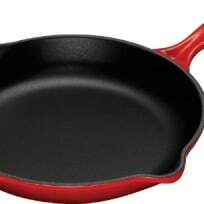 You definitely need to have a lid for your skillet—it’s key to the quick cooking method. 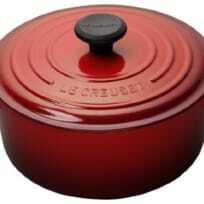 It has a large lid, which is perfect when making a one-pot meal. 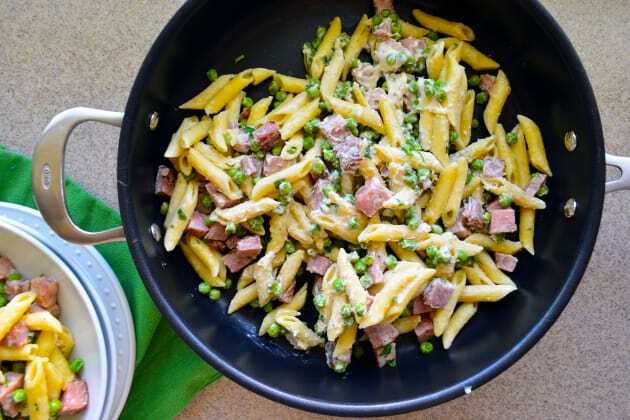 You’ll want to sauté the cubed ham for a few minutes and then add in the chicken broth, onion flakes, Italian seasoning and penne pasta. 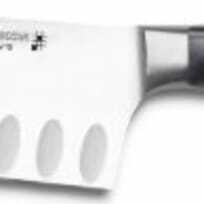 You’ll want to mix it well and reduce the heat to medium. Here is where the lid comes in to play—you’ll want to place the lid on the pot and cook for 15 minutes. You can set the table, do the dishes, come back in periodically and stir the pasta. Once the pasta is cooked you mix in the green peas, heavy cream, and Parmesan cheese. Then mix it well and season with salt and pepper. 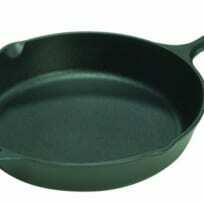 Now place that glorious lid back on the skillet and let it rest for a few minutes off the heat. Honestly, letting it rest is key. It gives the cheese sauce time to rest and absorb into the pasta. 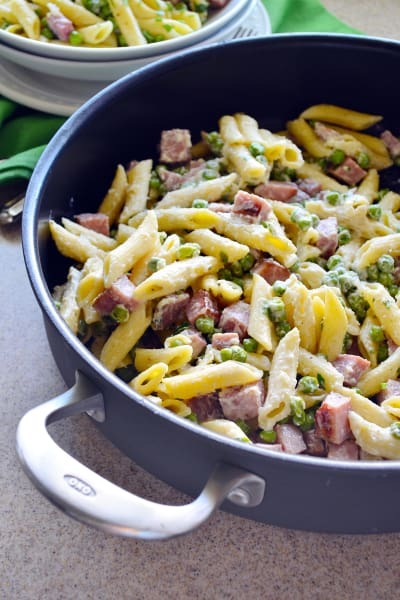 So if you're in a dinner rut or just looking for a new one pot pasta recipe, give my recipe for one pot creamy ham & pea pasta a try. 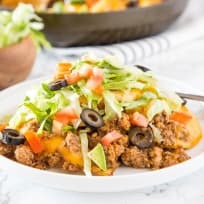 I promise it’s quick, easy, and delicious! In a large skillet melt butter on medium-high heat. Add the diced ham to the skillet and cook for 2 minutes. Add in the chicken broth, onion flakes, Italian seasoning and penne pasta. Mix well. Reduce the heat to medium and place the lid on the pot and cook for 15 minutes. Mix periodically. Turn off the burner. 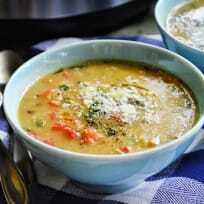 Mix in the green peas, heavy cream, and parmesan cheese. Mix well and season with salt and pepper. Let sit with lid on for 3-5 minutes.